Remember last February, UU ran a notice about the Showtime series Shameless filming near Broadway and Lawrence? Last night the results were on the show's season finale. 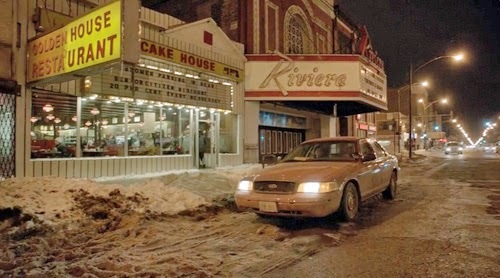 The reader who thoughtfully sent us these screen grabs says, "The Golden House Restaurant next to the Riv was used in tonight's season finale of Shameless. It looks like it's gonna be a major location for season 5." Here's hoping! UU Note: The Chicago PD episode (#11 of the season) that shot at the Dalia Food Mart and at the Bridgeview Bank Building last winter is supposed to air on NBC on Wednesday, April 9th. The DVR guide doesn't mention anything about a bank robbery, but we'll watch anyway, just in case. A week or two after the filming of Shameless, someone was outside Golden House with a blueprint, taking very careful measurements of the windows. I overheard him say they were going to recreate the restaurant on a sound stage (I'm assuming he meant in Hollywood). The TiVo description for Chicago PD on 4/9 says a massacre occurs and $8M is stolen so not a "bank robbery" but it is probably the episode in question. 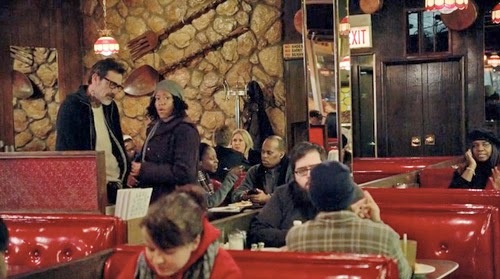 Season 5, Episode 11 of "Shameless" (called "Drugs Actually") used the Golden Pancake House heavily to discuss infidelity. In Season 6 Episode 3 Fiona and Sean are discussing the breakup with Gus and the F word song in front of the Pancake House. This is not the actual Pancake House next to the Rivera Theater. The real one has a white moveable letter sign below the Yellow and Red Pancake House banner, not Patsy's Pies. The real place has an additional sign perpendicular to the buildings: "Golden Restaurant". When Fiona leaves, there are steps across the street that look like L train station steps. There are no L tracks immediately across the street in reality; just buildings. Look on Google Street View to see the real Pancake House location, 4744 N. Broadway. Cinematically the scene works. You think you're in Chicago, but you are not. I grew up in uptown so it was kinda funny to see it on a episode of shameless. Too bad they now use a soundstage . I'm currently binging on Shameless and noticed the El across the street from Patsy's Pies. From my tour of Warner Brother's Studio lot, I surmised that EL was used in scenes on ER and across the street was Doc Magoo's diner. Doc Magoo's was tranformed into the Kash and Grab and then into Patsy's Pie. When they shot that originally, they did it during the Polar Vortex. They had to warm the cameras with blow driers to keep them from freezing, according to Emmy Rossum's Twitter feed. No wonder they moved it to a sound stage.